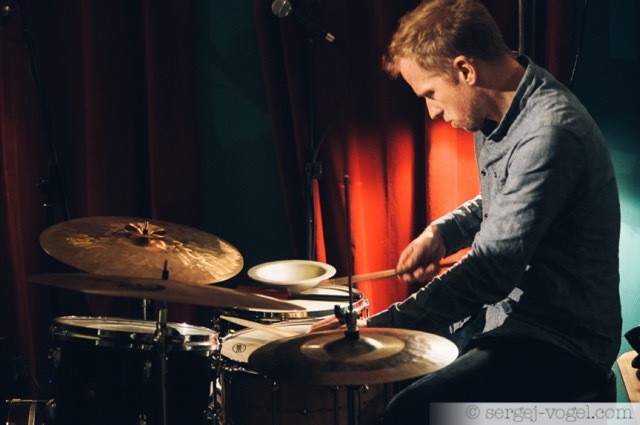 Adrian David Krok is a Polish drummer living and working in Berlin. He is involved in a wide variety of musical projects, mostly in the direction of free improvisation, free jazz and experimental music. After studying music for a short time in Switzerland, he left the academic music world and continued to expand his technique and personal approach through self education and experience. His approach to the drums embodies a combination of static grooves and beats with extended techniques and more textural elements, utilizing objects and preparations in addition to playing in the traditional manner. His playing is characterized by an incredible sensitivity and awareness, but is at the same time powerful and direct. He has performed and toured across China, Switzerland, Poland, Germany and Austria with a wide range of artists from many different genres, including jazz, rock and pop, in addition to more experimental and improvised music. Among others, he has worked with Mateusz Rybicki, Gregor Siedl, Abigail Sanders, the Berlin Soundpainting Orchestra, Rieko Okuda, Antti Virtaranta, Nana Pi Larsen, Simon Rose, Lan Cao, Miriam Siebenstädt, Christopher Uhe, Michiyasu Furutani, Adam Goodwin, Antoine Mermet and Lennart Heyndels, Marialuisa Capurso, Liz Kosack, Edith Steyer, Eric Wong, Eric Trejo Santiago, Davide Piersanti, Davide Lorenzon, Brianne Curan, Antonio Bravo, Michele Pedrazzi, Kriton Beyer, Amélie Legrand, Tatsumi Ryutsy, Caroline Cecilia Tallone, Wojtek Makowski, Emilio Gordoa, Scott Weiner, Andreas Willers, Gerhard Gschlößl, Masahiko Ueji, Klaus Schöpp.